And what do I see? I see September being a very, very busy month. Especially on the crafting front. See all that yarn in the photo above? Yeah...that all needs to be knit up by the end of the month. Well, except for the grey project. That's my Dahlia cardigan, and yes, it's still not finished. My fears of not having enough yarn to finish it have all come true. I don't even have enough yarn to knit 3/4 length sleeves. 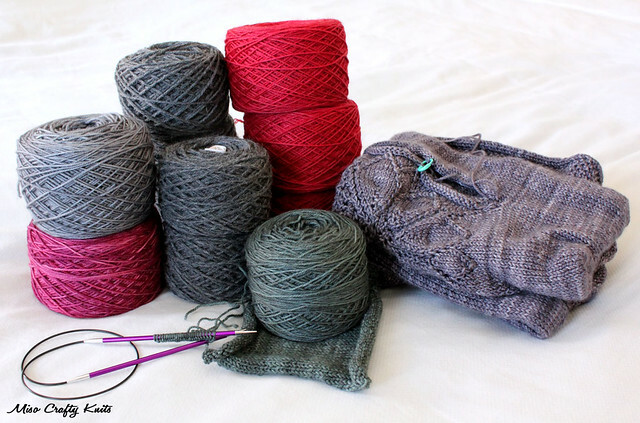 So now the project is on hold while I go on a hunt for another skein of Pashmina in Composition Book Grey that comes even remotely close to what I have, even though I think the chances of that happening are pretty slim to none. Le sigh. In the meantime I've got to get another cardigan underway. You know how a lot of knitters that attend Rhinebeck knit special Rhinebeck sweaters? Well I want to knit a special Knit City sweater. So far I'm not having any luck with my swatches. Double sigh. I've already had to change the colour (I want to use local yarn that I already have in my stash...cause let's face it, I don't need to be buying more yarn!) and I really don't want to change the pattern from my original vision of what my Knit City cardigan should look like. I'm determined to make this work, even if it means a lot of late nights this week. I'm also doing some test and sample knitting. Until these patterns are released I really don't want to say much about them, which of course makes for poor blogging fodder. Other crafty endeavours that I'm hoping to accomplish this month: sewing. My Etsy shop is in a major need of an update. I haven't been able to get much (if any) sewing done in the past few months. The bags I have sewn were bought before I was even able to list them in the shop. There were a few "new" items that I've been working on but aren't ready to be added to the shop yet until I can get the items the way I want them to be, and I need to tweak the production a little to make it as efficient as I can considering my limited sewing time. I would like to say I'll be doing a big update at the end of the month, but it'll more likely be one or two bags being listed within the next few weeks. Phew! As if all this crafty business wasn't enough, I've got my hands full of all the life things that'll be happening this month...beer fest (ok, that's more for Brett but it means I'll be flying solo with the Munchkin all weekend), golf tournaments (again, that's more for Brett and me being in charge of two toddlers), Brett's out of town business trips, my own day trip to Vancouver, a parade of guests, the Munchkin's speech therapy sessions...oi...it's just endless! I guess I better get crackin'. Don't be alarmed if I disappear from the blog a few days at a time. Just know I'll be thinking of you all whilst I tackle life and this knitting to-do list! Sounds like your a super busy lady this month!! Sooo looking forward to seeing your etsy update:) wish I lived closer to help with the munchkin;) it helps me to trade kiddo sitting for crafty time around my hood! Knit city is going to be so new sweater worthy!! I'm knitting through stockinette zombie hell right now cause i'd love to have a new one to wear too! !